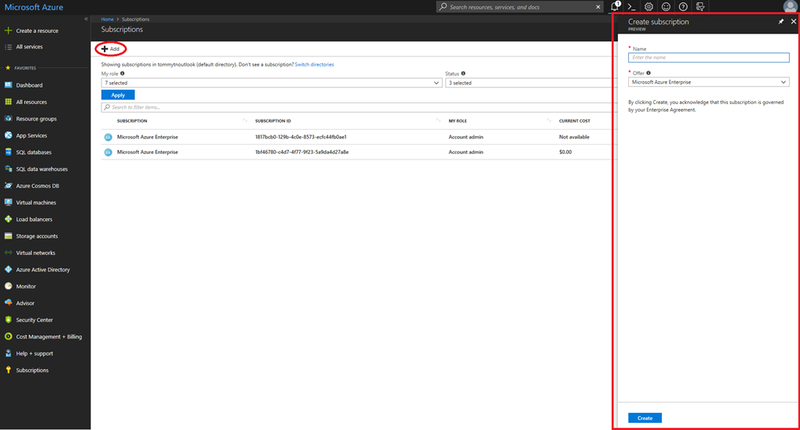 Typically, Azure Enterprise Agreement (EA) subscriptions were created in the EA Portal and management of services was completed in the Azure portal. Our goal is to converge on the Azure portal as the primary avenue for users to manage their Azure services and subscriptions. We are making available the public preview of the create subscription experience in the Azure portal. This capability will directly align with the the ability to create multiple enterprise subscriptions using the Create Subscription API. This experience is fully integrated in the Azure portal and will enable you to quickly get an EA subscription created without any programming. The following steps only apply to EA and EA Dev/Test subscriptions. The majority of users will be able to access the user experience below. There will be some users who do not meet the prerequisites to create a subscription in the Azure portal. For those users, the “+Add” button will open a separate window to create new subscriptions. If you are not an account owner, get added by an EA enrollment admin. Navigate to the Subscriptions extension in the Azure portal. Click the “+ Add” button in the top left corner of the experience. Fill out the new subscription name and offer. You will be able to change the subscription name later using the rename capability, if needed. A notification will appear the upper right-hand corner, indicating that the new subscription is being created. It might take some time for the new subscription to be created. After a few minutes, be sure to refresh the Subscription extension to get the latest subscription list.